Impressively directed, beautifully animated and superbly written, this is a hugely enjoyable, frequently funny fast-paced adventure with thrilling set pieces, great characters and a witty script. 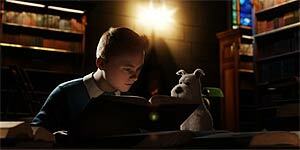 Directed by Steven Spielberg (who co-produced with Peter Jackson), The Adventures of Tintin: The Secret of the Unicorn is a motion-capture animated adventure based on the comic books by Hergé - specifically most of The Secret of the Unicorn, with large chunks of The Crab With The Golden Claws and bits of Red Rackham's Treasure thrown in. Jamie Bell voices intrepid boy reporter Tintin, who, along with his faithful dog Snowy, finds himself targeted by gun-toting goons when he buys a model ship called The Unicorn at a local flea market. Tintin soon discovers that the mast of the ship contains a parchment that holds the key to a long-lost treasure, so he and Snowy set off around the world on a treasure hunt, hoping to stay one step ahead of the sinister Sakharine (Daniel Craig), the boss of the afore-mentioned goons. Along the way, Tintin befriends sozzled sea-dog Captain Haddock (Andy Serkis) and receives varying degrees of help from bumbling detectives Thompson and Thomson (Simon Pegg and Nick Frost). Jamie Bell is perfectly cast as Tintin, capturing the character's ever-questioning earnestness and sense of adventure, while there's strong support from a joyously animated, scene-stealing Snowy, even if he is stripped of the interior monologue he has in the comics. However, the supporting honours go to mo-cap veteran Andy Serkis, who's brilliant as Haddock and is so life-like that you can practically smell the whisky on his breath (fans of the books will be pleased to know that Haddock's distinctive swearing has also survived intact). The script (by avowed Tintin devotees Stephen Moffat, Joe Cornish and Edgar Wright) is packed with witty gags and references and does a good job of both blending the various sources together and keeping things moving. Similarly, Spielberg directs with a terrific sense of pace and there are some wonderful, Indiana Jones-style action set pieces (the extended bike chase in Morocco is genuinely thrilling), though you do occasionally wish everyone would slow down a bit. The beautifully rendered motion-capture animation is the best seen so far on screen and if they haven't quite nailed the dead-behind-the-eyes problem, they've at least got to the point where it's not as jarring anymore. That said, the undisputed highlight of the film is the fabulous, Catch Me If You Can-style opening credits sequence, done in the style of Hergé's original drawings and packed full of fun references to the other books. The Adventures of Tintin: The Secret of the Unicorn is a thoroughly enjoyable, superbly animated adventure that captures the spirit of both Spielberg's Indiana Jones movies and Hergé's classic characters. Great John Williams score too. Highly recommended.